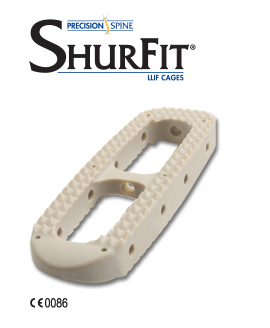 The ShurFit® LLIF Interbody Cage is a minimally invasive, self-distracting vertebral body replacement system featuring a complete line of disc prep instruments and multiple retraction options that allow for optimal access and unrestricted visibility. 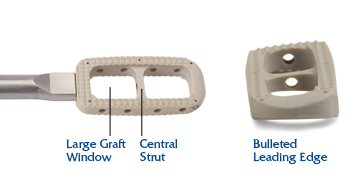 The PEEK-OPTIMA®* interbody design provides five footprints with a 7° lordotic angle to assist in reproducing the patient's sagittal profile while providing anterior column support. The LLIF Cage incorporates an aggressive tooth pattern and a central strut to provide an overall stable platform, while the large graft windows promote fusion.